Video hasn’t killed ALL the radio stars. Whew. I haven’t posted in a week. But I’m back, I think. I didn’t even have enough time to get annoyed enough to flip anything off. Last week was crazy, crazy busy. After being out of school for a week for SNOWMYGOD 2011, I just had a bunch of catching up to do. And then I started a new endeavor. Since I’m sure you are all curious, I’m going to share. I am going to do a weekly segment on a sports radio channel. No really. One hour a week I am going to join The Cole Cubelic Show on 97.7 The Zone. A sports talk channel. pause for hilarious laughter, snorting and general incredulity. Okay, I confess it does seem to be an off match. There are few things I know less about than sports. Maybe chemical engineering and cars. Maybe. So I was a little surprised when Cole emailed me to see if I would be interested. But hey, I’m up for anything and said sure. Seriously. I’m useless at sports. When I was a child, I took golf and tennis lessons at the country club in the summer but all I liked to do was drive the cart and see if I could hit the tennis balls into the road towards passing cars. And then after working up a drop or two of sweat, I’d head back to the pool and order lunch. I am more likely to call the uniforms outfits and thought a Pro Throw was a thing, not a person (It’s Prothro and he was a wide receiver for the University of Alabama.) I also didn’t know who Mark Ingram was. I was pretty sure he was a football player but didn’t know he won the Heisman-which is apparently a big deal and Reggie Bush had to give one back. BUT I need YOUR help reader people. Since you are all clever and witty people I need title suggestions for my segment. Anybody? Can you think of a name to call my sports thing? Please? Okay, first, that’s awesome. And so much fun! 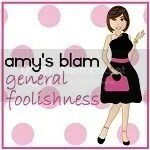 It could just be something as simple as Amy’s Sports Blam. Or maybe Gossip’s a Peach? Oh wait, that’s Georgia. Sorry. Hmm. I may have to think on this a while. I’m thinking….I really am…need some time on this one. I really want to use Jock Straps in the name for some reason. Hmmmmm…. Big time congratulations! And by the way, pink sister, I had no idea who any of those people were you were talking about. It was like you were speaking French or Math or something. I’m sure you were awesome in your sparkly Amyblam way. Since I had a glass of wine while watching the Housewives’ reunion and since I’m a complete lightweight, I can’t use my fuzzy brain to think of a snappy title. I’ll get back to you. Once again, huge, huge congratulations. Amy, I just don’t even know what to think. Is it the end of the world?